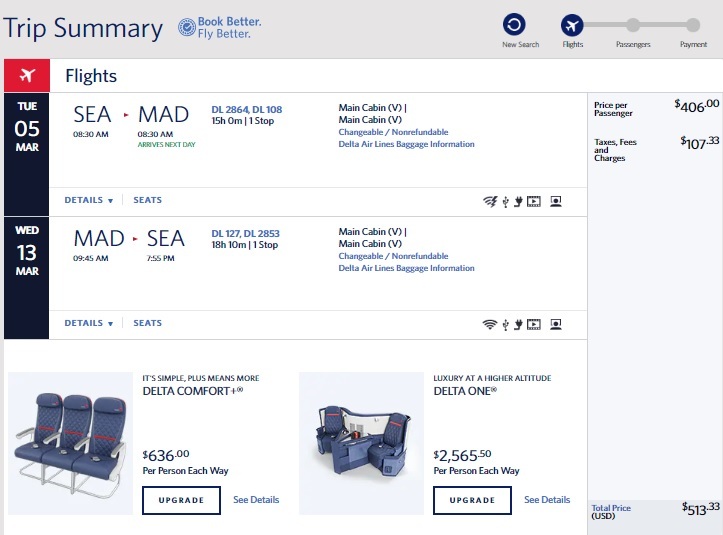 A nice sale from Delta on the Seattle to Madrid route. There have been lots of cheap fares to Europe lately but they are dominated by Basic Economy fares with no luggage or seat assignments included. This is a Regular Economy fare, however, that includes ONE checked bag, a normal sized carry-on and advanced seat assignment. Availability from January to March at $513, as well as April and May for about $15 more. Must depart Sunday through Wednesday and return Tuesday through Thursday. Thanks to our friends at The Flight Deal for the frugal fare tip. Use ITA Matrix Software to find the best dates. Book direct through Delta for the cheapest fares! Jun 7 Seattle to Madrid, Spain from $391RT! Aug 11 Seattle to Madrid, Spain from $429RT!